I'm not sure how, or even why this idea came to mind. Maybe it's because everywhere I look I see some kind of marquee letter or sign in lights. So I guess it's only normal to turn it into a brownie, right? Well, my normal. And it's the perfect way to direct guests to the party! When I showed this to my mom and daughter, they both responded with "That's a brownie?" Which I answered, "yep, it's a brownie." But why? That's a question yet to be answered. And how? That's a question I will answer! It all started with a pan of brownies. Bake your favorite brownies in a parchment lined 9" x 13" pan. Make sure the parchment comes up the sides. Once the brownie has cooled, lift the brownie out of the pan, using the parchment paper as handles. Cover and freeze the brownie. 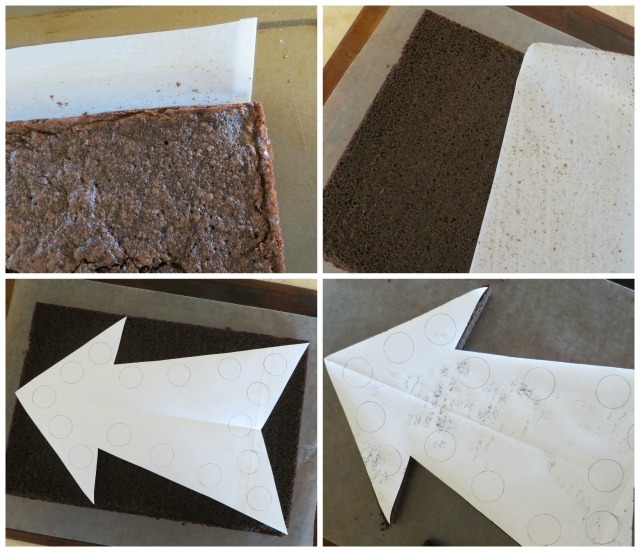 Remove from freezer and invert brownie on another sheet of parchment paper, remove the top layer of parchment paper. 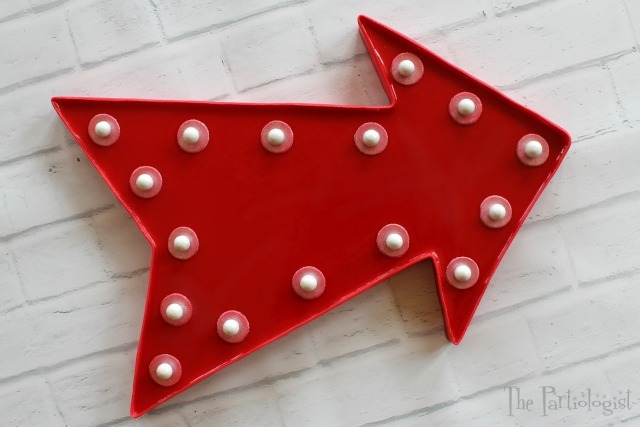 Cut an arrow template and lay on top of the brownie. With sharp knife, cut around the template. Roll a looooooooooooooooooooooooong piece of red fondant. Cut with a No. 4 strip cutter (or knife), continue until you have enough to go around the edge of the brownie. Let the fondant dry just a bit, to hold it shape, but not too long or it will crack. Wrap it around the fondant roller. With a #5 decorating tip, begin piping red frosting to the side of the brownie. Gently unroll a small portion of fondant and apply to the side of the brownie. Working slowly, add small sections of fondant at a time. Continue adding frosting and fondant until the entire brownie is edged with fondant. Trim the fondant, making a seam. Next mix up a batch of red glaze icing, making sure it is of pouring consistency. Begin pouring the glaze icing onto the brownie. 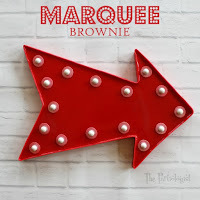 Using a spoon and toothpick to fill the edges, cover the entire brownie with the red glaze. Roll more red fondant and cut round circles with the bottom of a decorating tip. Paint each red circle with white luster dust. With a white shimmer sixlet, make an indentation into the fondant. Add the circles to the top of the brownie, spacing accordingly. Paint a bit of water on the bottom of a white shimmer sixlet and add to each red circle. Mix powdered sugar, water and corn syrup. Add almond flavoring and food color. 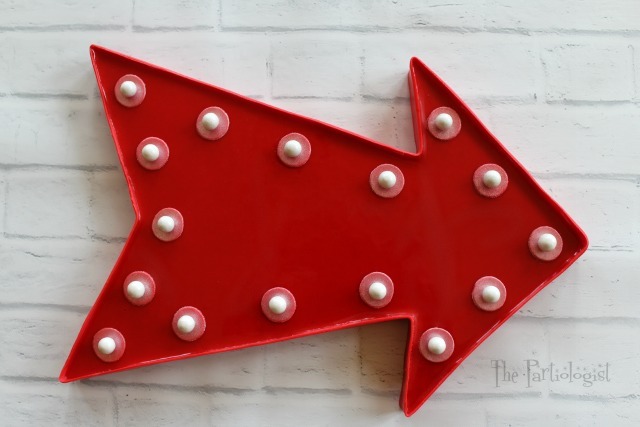 This way to the PARTY! That is one great brownie!!! And it looks so real! I'm not sure how you come up with this stuff either! It's Amazing!!! OMG, I thought the first picture was an actual marquee sign. WOW, it looks so REAL! You did an amazing job with this. Wow, wow, wow. wow, this is incredible! You're so innovative! Thanks! You're right, it would be a perfect dessert for a drive-in b-day party. I was so happy with the way it came out and really much easier than I thought, thank you!